Peterborough United manager Graham Westley was left rueing the shocking start his side made in their 2-1 defeat to Rochdale yesterday (April 9). 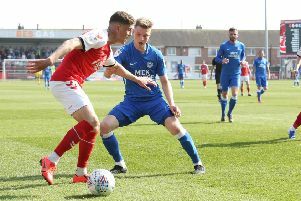 Despite a midweek telling off from Westley, Posh made an awful start to the first period and allowed Rochdale to grab a deserved two-goal lead inside 25 minutes. “We were lacklustre, nervous and hesitant in the opening 20 minutes of the game and it took us to fall two goals behind until we started playing,” said Westley. Posh got back into the game thanks to a long-range strike from Michael Smith but never looked like drawing level despite having 70 minutes left on the clock. Westley said: “It showed a large amount of character for us to bounce back and get into the game but that’s not good enough if you start so poorly. We have to look at it collectively at what went wrong. Despite having another disappointing League One campaign, Westley has been charged with not just promotion but title ambitions by chairman Darragh MacAnthony. “We need to step up the quality in depth in the squad which is obvious and it is something that we will do in the summer” said Westley.